امروزه با انقلاب اطلاعاتی، اهمیت توسعه اطلاعات و به کارگیری آنها در هرگونه فناوری امری غیر قابل انکار اسا. 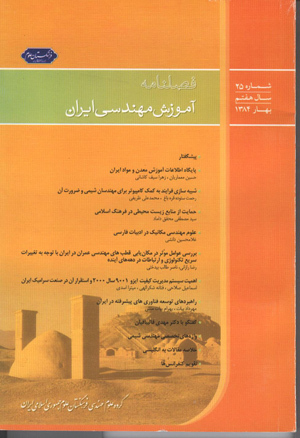 در این مقاله شاخص های عمده اطلاعات بررسی و ضرورت استفاده از ابزارهای جدید به منظور کاهش فاصله طولانی کشورهای در حال توسعه با کشورهای توسعه یافته که کیفیت زندگی مردم را بالا برده و قابلیت دسترسی به اطلاعات بیشتر را برای مردم به وجود آورده و فرصت ها و اشتغال بیشتری را برای همگان فراهم کرده ، بیان شده است. During the Past two centuries three vast industrial revolution have occurred in the man’s life which have established the starting point of profound and substantial changes in various fields. The first revolution occurred in the 18th century based on the steam engine invention and making use of steel and coal following which the second industrial revolution happened in 1930,s elapsing with coming into existence of airplane and discovery of oil and making use of organic chemical elements in the man’s life. The third industrial revolution, on the other side, occurred from 1950 which had been hased on electronics – computer – information technology (IT) – network production – nanotechnology, biotechnology, molecule engineering, genetic engineering, expansion of oceans and new methods of transportation and knowledge. The third industrial revolution made various countries enhance their stand in the word economy as well as their national economy. The new revolution has new basic and particular technologies. The countries which more speedily prepare infrastructures required for applying these technologies will be the forerunners. The information revolution, from the significance viewpoint and influence is not considered less important than industrial revolution. The revolution will provide a new and eye-catching capacity for the man’s intelligence and knowledge frontiers and will create the tools which change the nature of the work and life. On of the best methods to get acquainted with the way new information and communication technology work and to know their nature may be using of the Information Society Index (ISI). -Skaters: Those countries that have complete capability to enjoy all information and communication revolution. These countries have required infrastructures, software’s human and financial resources and other required possibilities. -Striders: This group of countries step forward decisively in the information era and possess many required infrastructures. - Sprinters: These countries make their best efforts to further toward information – communication society. However, having no choice they take a breath. In fact, economic, social and political pressures compel them to change their priorities. -Strollers: These countries are also stepping forward, however, unstably and with difficulties, the main reason of which is considered to be shortage of financial resources. The existence of state monopolies and the most important of all lack of available information, have caused obstacles in development of information and communication in these countries. The global trend and events stresses the need for paying attention to technology policy and determination of priorities. Important international events such as disintegration of communism and taking form of the Uniter Europe and coming into existence of the World Trade Organization (WTO) have all brought about profound changes in the world economy. Process of such events and trends is the division of the world activities in the world activities division process, capabilities of countries in business and the world suitable role have full dependence on their technology. Those countries not having technological capabilities will be driven aside (and marginalized) and will assume weaker roles. The pressure and speed of the changes are in a way that they make it difficult for make amend for retardation and efforts for achieving better roles as the time passes. Adopting suitable policies for earning and managing knowledge and technologies and prioritizing technology are the most significant stride in attempts toward earning a suitable and proper global stand. Countries, by prioritizing IT and through investment in these technology can leave behind the unemployment crisis and will be able to step forward more speedily. In order to take over the technology leadership attention must be fully paid to preparation of technological infrastructures and afterward the bases of technology knowledge (training and physical education), technology man power (Scientists – engineers and technical and engineering firms) and knowledge and technology policies must be fully clarified; otherwise, follow suit roles must be admitted. Countries such as Iran must, one way or another, get accustomed to new technology progresses and place itself in their track, for we are no exception in this arena. We will either knowingly prioritize these technologies, asses and juxtapose them with our needs and benefit from utilizing them and will localize them or these will be forcefully imposed on us which is the tough lesson of survival. While recapitulating the reasons for success of countries in development and expansion of new technologies (considering infrastructures) and general belief on the fact that information technology is considered as a key for economic growth and the reason for substantial changes in every society and is a tool to shorten long distance of the developing countries) this article intends to enhance people’s living standards, to pave the way for better availability of information for people and to provide more employment opportunities for everybody and to analyze all the aspects mentioned.